Augmont App – Get Rs 50 Free in your Bank Account. Augmont, India’s biggest gold Refiner and Bullion Supplier/“Refining to Retailing” entity brings you the convenience of buying gold & silver directly from its refinery, ensuring that you buy gold & silver at the lowest prices possible. Note:- Offer is valid till until banner is showing on Augmont App HomePage (bottom side). Try lower value, Instead of Rs 50-51, Please try Rs 48 to till Rs 45. Hey common man, refer is getting silver, that only can be deliver. But you have brought gold so sell that gold. keep watch carefully while transacting…. We post only verified Offers !! This offer is available for old user or new users??? Jo free me mila h wo Sell nhi ho rha? Any trick thn help me? Gold Quantity purchased via cashback amount cant be transfered to bank. Only principal amount is being transfered to bank. Update 2:- Sry , just put a little lower value and the amount can be transferred. Do I need to Complete my KYC to sell gold or not..? Have you tried this? Because i am getting Refer and earn quantities can not be sold back! Seems, All People didn’t Notice our Step no.8 ? OK. Yashveer bro sorry! I didn’t noticed! Actually i tried till 49-51 only. Now i entered 45 Rs worth gold and it successfully transferred the gold to bank. Title is little bit misleading, but in Steps we have clear everything..
We have turned off “author Links”. for the resolution on your issue and write back on [email protected] to get help !! Its not a Fake app, earlier they give fee silver coins on Refer and earn. We suggest you to sell less quantity than available quantity, after that it will be transferred to your bank !! i just tried and got OTP in less than 3 seconds !! So may be problem is in your sim, why not give a try to other sim number? Bro solver me bhi 39 rs show kar raha hai ye bhi bank me transfer karne ka koi tricks hai kya?? excpet refer and earn.. All are transferrable !! sell mein amount gram mein mang rha h but usmein point use nhi kr para any solution??? Try again, it will work for sure !! No.. Don’t use multiple times. 24 and 25th is bank holidays. After that you can count 3 working days. No. you can’t use multiple times. Use 1 time only. Buy gold and then sell gold for bank cash !! Totally fake app. The don’t do any bank transfer. I’m still waiting for my withdrawal. This kind of scammer pay this big site bloggers for post about their apps to scam people. I just want to tell everyone that before invest your money must check about it rating and reviews online and only after that invest your money. If you think you will get money before 3 days (as per their terms and conditions), Then You are Wrong. If you think RBI will clear NEFT on Bank holidays, Then You are wrong. We already said a lot of Times, Try to sell Lower amount of your Gold. If you have gold worth Rs 100 then sell only Rs 95-96 or Rs 47 if you have Gold worth Rs 50. Did you read first 20 comments in this Post? By the way, we already said in upper comments, we have verified this offer personally. The Gold which you will buy from your 51 Rs/- Cashback can’t be sold back and thus they will not allow this money to be credited into your bank account but only the Gold which you will purchase from your money i.e 51 Rs/- can only be sold back which will become of value 49.1 Rs/. Thus it is useless to go through this offer which will not only waste your money but time too. We approved all comments (Positive as well as Negative). For your information, All comments need my approval to be visible on our website. These days we will take 1-24 hours to approve users comment. Wallet money can’t be transferred to Bank. So you have Rs 51 gold + Rs 51 cashback in augmont wallet. So buy gold from that cashback. After that you have to Sell Gold for Bank Transfer. Any one got their amount in bank? Anyone got their amount in bank? Yes.. i just recieved.. They sent me via IMPS !! Anyone recieved?? Let us know via Comments. He not Asking about you. He ask us. Who scammed by this app just because of you. If you get your payment via IMPS. Why don’t you take a screenshot and post it on your site. So we know that they pay. I’m already lost 100 INR. Already 4 days spent since I request for bank transfer. Let see did I till get or not. Btw don’t forget to post your payment proof. I am sure they are processing payments, as they didn’t recieve 100-200 request, Its more than your thinking. Why not drop a email to [email protected] they are trusted and recently give free silver on refer and earn. Yes i received in 2 account. Looted from 5 accounts,with same bank account ?? 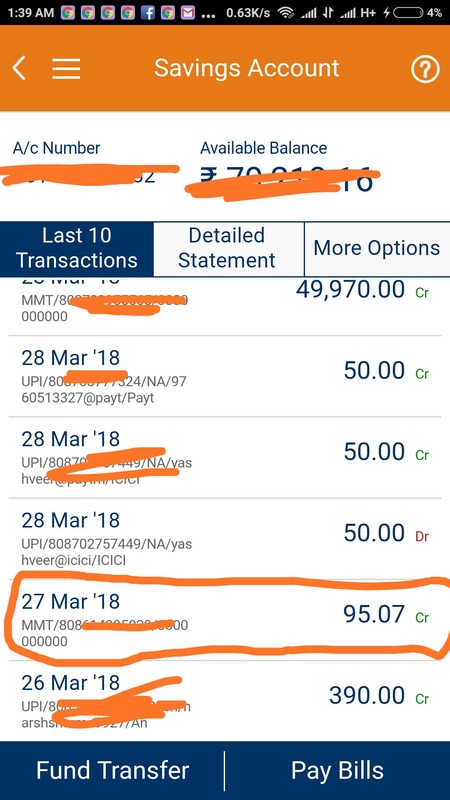 bhai abhi tak nhi aye abhi bhi pending hi arha h saturday hi kra tha or aaj pura ek hafta hogya email bhi kiya koi jawab bhi nhi aya….